I found an interesting article about the psychology of colors when wrapping gifts for Valentine’s Day. A business color association in Japan conducted a survey of 250 females age between teens to 70s and asked them which color they choose for Honmei-gift (gifts for someone you love) and Giri-gift (gifts for acquaintances, for example, the bosses, co-workers, business partners, etc). Out of all the color choices they had, there are only four colors all the survey participants selected for the gifts for their loved ones…red, pink, gold and silver. And red seems to be the winner for most age groups. Now, this survey results might be different in different countries or cultures but I found another interesting result for my videos as well. This is my top 4 YouTube videos for gift wrapping tutorials. Can you see the similarity? For your information, my video viewers are from all around the world and I make many videos using cool color tones like blues and greens as well. The course will open in four days. 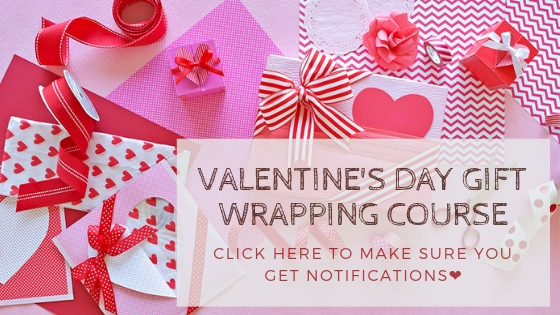 Let’s spread the love by creating beautiful gift wrapping this Valentine’s Day!